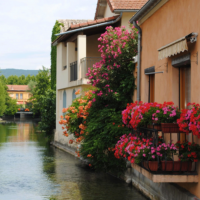 We’re excited to announce the dates for our Everyday Extraordinary Provence Decor Tour! From May 15 – 22, 2018 we’ll be living everyday- the French way. We’ll based from a fabulous mas in the heart of Provence,for a remarkable week of textiles + design; oh and of course, food + wine! We’ve put together an all-inclusive week of unparalleled design expeditions , amazing craft & techniques, treasure-hunting and much more; all set against centuries of history, Provençal meals to swoon over and true design camaraderie. Whether you are a fabr-i-holic, decor aficionado, creative traveler or a devotee of French style; this escorted, small group luxury design tour trip is for you. From private textile trunk shows, exclusive visits to venerable fabric houses, painting lessons and treasure hunting in Ile sur l’Sorgue to petanque, creating your own scent at a perfumerie in Grasse and an amazing Woad dyeing workshop by a master artisan at our bastide. Not to mention- we’ll spend full day in Lyon—the most famous silk city in France—with a complete overview of silk fabric and passementerie design and production, plus a private, guided tour to one of the world’s top drapery and upholstery workrooms. Topping it off, you’ll experience Provence as a design insider with what has become all of our tours’ signature- private design destinations- to some of the best and most exclusive ateliers, workshops, artisans, studios, markets and shops in Provence. I would love some details on the Provence trio.